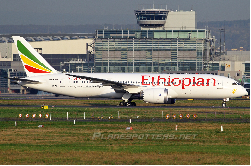 Whilst stationary, the nosegear of an Ethiopian 787 collapsed at Addis Ababa Airport, injuring one cabin attendant. 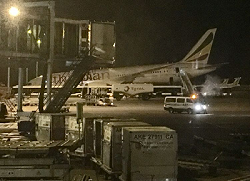 Ethiopian Airlines flight ET 702 to Rome just completed bording whilst parking at its stand on the tarmac at Addis Ababa Bole Intl Airport, when (around 21:00L) the nosegear suddenly gave way. The airliner tilted down until it came to rest on its foreward fuselage. One (poss. unsecured) cabin attendant received injuries in the incident. It is unclear wether the pushback tug was already connected. 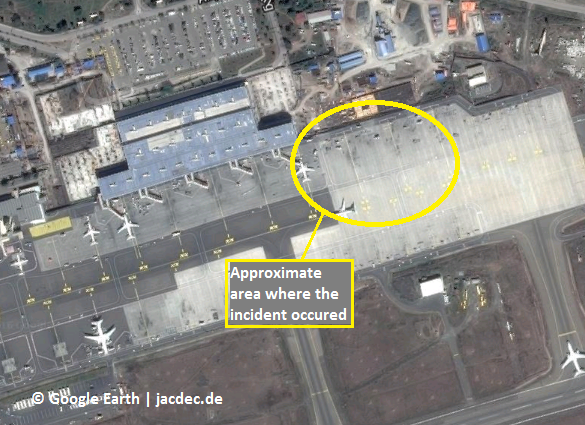 Damage to the aircraft is considerably ‚above minor‘. The upcoming flight to Rome was cancelled until further notice. According to an unconfirmed ’source of insight‘, the aircraft had already been plagued by a series of gear warnings in the past and technicians were ordered to the 787 to resolve the issue by recycling the gear lever. However on this day, no safety pins were inserted to the nosegear resulting in a lack of protection against gear-retraction.